Kalani's Rhianna Farm scored four points last night. Courtney Gaddis scored 10 of her 13 points in the pivotal second quarter as No. 2-ranked Kalani overpowered Moanalua 50-33 last night. Megan Kamehiro had 13 points and two steals for Kalani, which improved to 3-0 in Oahu Interscholastic Association Red East play (13-2 overall) by using smothering defensive sets. "We were in man, then our traps. Our coaches did a great job of adjusting," Kalani coach Darold Imanaka said. "No doubt the effort was there. This is a good bunch of girls, but we need to fine-tune stuff, like our offensive sets." Kalani's next opponent is another hot squad, Roosevelt. "If we play like this against Roosevelt, we're in trouble," Imanaka said. Moanalua, which was 8-4 with a diet of mostly OIA West teams, is now 0-3 in regular-season play. Two of the losses were by small margins, but Kalani was simply too strong. Jamie Ronolo led Na Menehune with 15 points and four steals, but got worn down at times by constant defensive pressure. "It was obvious that they were trying to shut me down," said Ronolo, who shot 5-for-12 from the field. "They're physical. They're patient, but they have tenacity. They're a tough team. That's why they're second in the state." Rotating starters and reserves liberally, Kalani closed out the half with a 6-0 run, including two more steals for buckets by Gaddis. By halftime, Moanalua had 12 turnovers -- 10 in the second quarter -- and Kalani led 31-14. "They're well deserving of their ranking," Moanalua coach Rick Gonsalves said. "They've assembled quite a team. Their size and long arms cause you to get out of your offense, alter your shots." KALANI--Chloe Martin 3, Kayla Kimura 0, Brandi Yamaguchi 0, Kim Balsai 0, Violet Alama 6, Allison Nuessl 2, Kim Cabuyadao 2, Chelsea Kimura 4, Megan Kamehiro 13, Tia Kobayashi 0, Kacie Gushiken 2, Rhianna Farm 4, Alisha Bonifacio 1, Courtney Gaddis 13, Chaude Bonifacio 0. MOANALUA--Brianna Lagat-Ramos 2, A.J. Verdida 0, Hoku Dela Cruz 2, Michelle Hardy 0, Jalencia Brown 0, Janelle Uncangco 0, Jamie Ronolo 15, Indah Widyakusuma 6, Britni Ronolo 8, Dawn Dela Cruz 0. 3-point goals -- Kalani 3 (Kamehiro 2, Gaddis), Moanalua 1 (J. Ronolo). Angie Gasio scored 13, Elane Leaupepe added 12 and Natalie Mata 11 to form a three-headed Governor attack against the previously unbeaten Red Raiders. KAHUKU-- Taeja Afalava 6, Brittney Fesolai 8, Kelcy Latu 0, Krystle Manguba-Glover 3, LeNora Nauahi 6, Vaimalama Tito 4, Elizabeth Hill 0, Nicole Nautu 6, Keisha Moeai 2, Alayna Galeai 6, Tania Latu 0, Kenra Moe 7. FARRINGTON-- Natalie Mata 11, Cani Kealoha 3, Jorell Telefoni-Sablan 6, Macilee Moi 5, Deja Bryce 4, Valerie Lesu 6, Angie Gasio 13, Delissa Cotton 2, Honour Stone 0, Sandy Valdez 0, Elane Leaupepe 12, Polohiva Folaumahina 0. 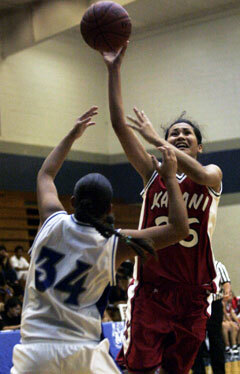 3-point goals -- Kahuku 2 (Fesolai 2), Farrington 2 (Mata, Kealoha). Jazmin Pahukoa-Malia scored five of her game-high 13 points in the fourth quarter for Pearl City, while Tahnee Foki scored a team-high nine for Kapolei. KAPOLEI-- Loleina Lapina 0, Danniel Tapat 0, Ashlee Dela Cruz 7, Jasmine Gipson 4, Regina Simanu 0, Kesha Miller 1, Tamara Satcher 8, Jay Abbondanza 0, Cassidy Calio 0, Tahnee Foki 9. PEARL CITY-- Ariel Rivera 0, Tiffany Gadingan 2, Desiree Luis 6, Kasie Kunishima 0, Charee Heard 0, Kalei Adams 0, Ariel Komomua 3, Kaiona Auyong 9, Jazmin Pahukoa-Malia 13, Patricia Langi 4, Tearaina Meyer 0. 3-point goals -- Kapolei 4 (Dela Cruz 2, Foki 2), Pearl City 3 (Pahukoa-Malia 2, Komomua). Emma Atiga broke a 44-44 tie with two free throws with 6.6 seconds remaining and Niki Kobashigawa's last-second shot bounced off the back of the rim as the Seariders prevailed. WAIANAE-- Danielle Lovell 15, Brittni Dinong 0, Chaelyn Manuel 0, Emma Atiga 5, Dynasty Ayala 10, Genevieve Cuesta 0, Ngaire Yuen 9, Afioga Tago 2, Melody Moe 5. CASTLE-- Kori Berinobis 14, Candy Ames 3, Niki Kobashigawa 4, Kelsea Berinobis 4, Sarah Phromisiri 0, Chevy Au-Stein 4, Leesha Domingo 0, Ette Ameperosa 15, Nicole Aberilla 0. 3-point goals -- Waianae 0, Castle 6 (Ko. Berinobis 4, Ames, Ameperosa). Ashley Jacobs scored nine points to lead the Surfriders to their third straight win. ANUENUE--Ka'imi Asing 3, Kapela Kahili 0, Kenui Wahilani 4, Leikula Gottleib 7, Nalani Kamano 3, Pua'alekai Kimball-Aikau 0, Pikake Conradt-Nunuha 0, Punawai Crawford-Kapanui 2, Naalehu Tolentino 0. KAILUA--Kristen Corrales 6, Tawny Kiko 4, Chelsea Babylon 6, Miki Scott 2, Tianna McKeague 2, Zsalei Kamaka 7, Jarrish Mauhili-Kaneakua 1, Netia Ulugaono 6, Agnes Faaleaoga 4, Ashley Jacobs 9, Kahea Chang 2, Francine Sua-Godinet 6, Chevy Crowell 7. 3-point goals -- Anuenue 1 (Gottleib), Kailua 1 (Jacobs). Kimberly Meyerowitz scored 22 points and Chelsey Ramirez nailed four 3-pointers and added 18 points for the Bulldogs, who knocked off the Cougars in a wild double-overtime game. WAIALUA--Klleirr Tuyay 9, Shiree Dela Cruz 2, Misty Maxwell 8, Geena Pinacate 0, Salvie Alfanla 1, Abcde Tangtog 0, Kimberly Meyerowitz 22, Chelsey Ramirez 18, Brittney Basillo 12, Ashley Carillo 7, Noe Dela Pena-Ho'opai 2. KAISER--Sarah Aila 1, Jessica Dusich 18, Tiare Kepa 3, Kristyn Mathenson 25, Chelsea Okuma 14, Leandra Poole 13. 3-point goals -- Waialua 6 (Ramirez 4, Maxwell, Basillo), Kaiser 7 (Mathenson 5, Okuma 2).